Driving foot traffic to a business location can be crucial for success and proven to be difficult in many ways. Physical location matters in terms of natural foot traffic, but sometimes customers need an extra push to come your way to do business. Recently Thumbvista had the chance to work with the great brand of Dunkin Donuts. We put together a mobile marketing strategy than encompassed creative mobile display ads using geofencing to work with the consumer mobile device and GPS to guide the customer to the target location thus increasing rural location foot traffic and sales. Rural location inside gas station needing a boost in foot traffic and sales from commuters. Thumbvista ran mobile display ads geofenced a radius between 4 and 5 miles around the location and enable a GPS notifier showing the customer’s device distance away from the location. Thumbvista also built a custom landing page with a coupon embedded and links for customers to be able share coupon with friends via email or social media. 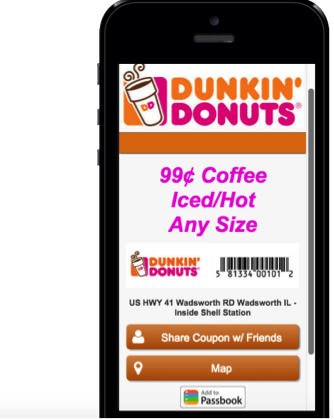 Thumbvista also link to a navigation map to the location and a Passbook Coupon for iPhone users with a reminder trigger on for target location. Over a 4 day period we had 164 customers click to get coupon in target radius. The top hours between 12-2pm. The top day showed a strong .76% CTR. Strong creative is key in getting a boost to a location via mobile display ads with both the mobile landing page and ads themselves.